The updated kitchen includes classic Shaker-style cabinets, oil-rubbed bronze finishes, and translucent glass pendant lighting. 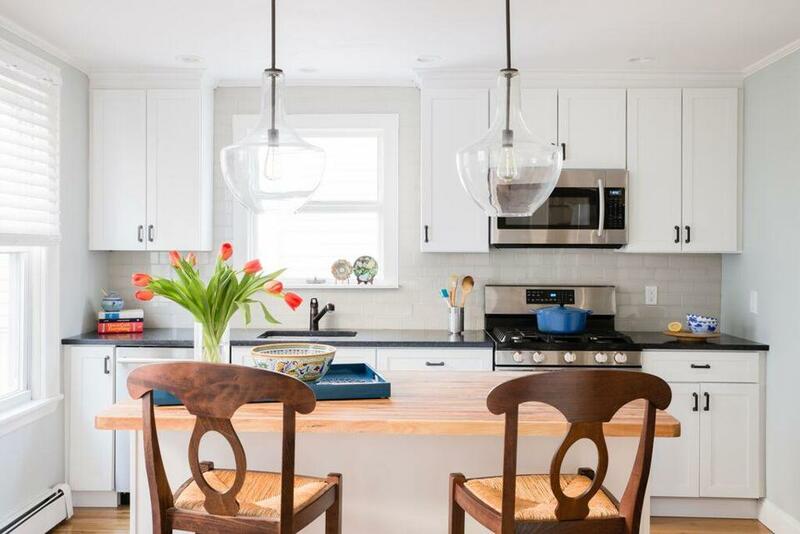 Milton-based interior designer Beth Bourque chose classic Shaker-style white cabinets to complement the traditional architecture of a young family’s South Boston row house. “We changed the configuration from L-shaped to just one wall, but added an island,” she says. Oil-rubbed bronze pulls from Rejuvenation provide high contrast. Hand-glazed ceramic subway tiles from Mission Stone & Tile line the entire back wall up to the ceiling for a sense of height. The honed black soapstone counter is practical and durable. The oil-rubbed bronze finish of the Moen faucet reinforces the pared-down palette. The island’s John Boos butcher-block top infuses warmth, creating a welcoming spot for meals. The teal lacquer tray by Masterpiece Woodworks neatly collects napkins, salt and pepper shakers, and such, while adding a pop of color. The silhouette of the mahogany bar stools from Pottery Barn echoes the curve of the pendants and softens the room’s crisp design. Marni Elyse Katz blogs about design at StyleCarrot.com.